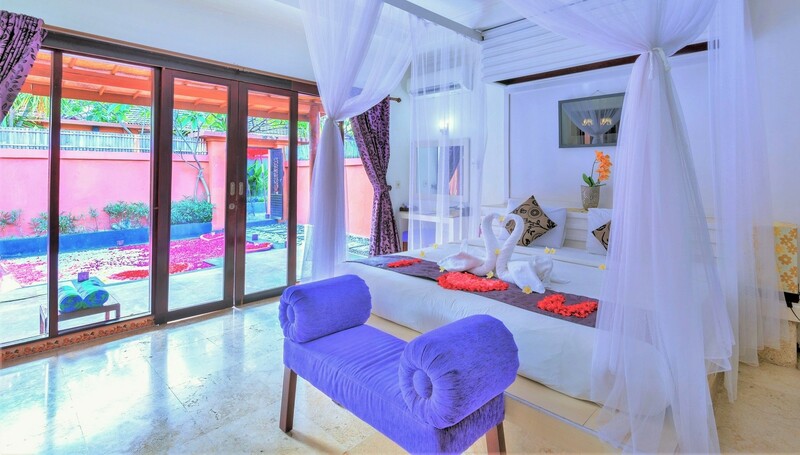 The Honeymoon Onebedroom pool Villas is created using a harmonious blend of traditional Balinese architecture with modern facilities and amenities. Service – oriented, friendly staff pamper guests with professional, personalized service in a comfortable, relaxing ambiance. villa comprises of 1 King Bed, a Desk & Chair. The room is furnished with modern furnishings and a balcony. Our modern bathroom with big bath tub is equipped with hairdryer, magnifying shaving and make up mirror as well as all the amenities you could possible need during your stay. A Complimentary of unlimitted mineral water are provided on arrival. Smoking area at our balocny with open area viewing pool and garden is make fresh athmosphere. The Honeymoon One Bedroom Pool Villas feature an bedroom with bed side sliding door wooden closet and a large bathroom with bathtub and shower stall, open air living room, dining area, private wooden sundeck pool surrounded with tropical lush garden and reveal exceptional comfort and tranquility. A Complimentary of unlimitted mineral water are provided on arrival. Smoking area at our balocny with open area viewing pool and garden is make fresh athmosphere.